Purpose: The purpose of this study was to assess the prevalence of dental anxiety and missed dental appointments due to dental anxiety among patients within three types of private dental offices. Methods: This descriptive, cross-sectional study utilized the Modified Dental Anxiety Scale (MDAS). The MDAS consists of five questions to assess dental anxiety. Demographics and an open-ended question about missed dental appointments due to dental anxiety were included. Linear and logistic regression models were used to analyze anxiety scores as related to gender and age. Participants' responses to the open-ended question were compiled according to themes. Results: Three hundred and eight (n=308) dental patients participated in the study. Using the MDAS cut-off scores of 15 and 19, the prevalence estimates of moderate to high and high dental anxiety within the total study population was 19% and 6.82% respectively. Females had an MDAS score 2.12 times higher than males (p<0.05). For every one unit increase in age, the MDAS score was 0.08 units lower (p<0.05). Out of the 308 participants, 26 (8.4%) responded to missing a dental appointment due to dental anxiety. Five common themes were coded as the source of dental anxiety: fear of dental experience, previous negative dental experience, cost of treatment, gag reflex, and fear of bad news. Conclusions: Moderate to high dental anxiety was present in 19% of the population sampled. Awareness of patients' dental anxiety level and the utilization of anxiety reducing measures during treatment may encourage routine care. The purpose of this study was to determine the prevalence of dental anxiety among a convenience sample of patients within three types of dental offices: general, endodontic, and periodontal; to identify possible correlations between dental anxiety, age, gender, and missed appointments; and to reveal, in their own words, what patients feel is the source of their dental anxiety. This cross-sectional study, approved by the Massachusetts College of Pharmacy and Health Sciences (MCPHS) University Institutional Review Board (IRB), assessed the level of dental anxiety and missed dental appointments due to anxiety among a convenience sample of patients in three different types of dental offices: a general dental office that offers sedation dentistry, an endodontic office, and a periodontal office, all located in Framingham, Massachusetts. Inclusion criteria included anyone over 18 years of age. Exclusion criteria included: those under age 18, those who were unable to read and write English, those who failed to provide consent, and those who failed to fully answer the questionnaires. Informed consent was obtained and the ability to refuse to participate at any point during the study was provided along with the dental anxiety questionnaire. The questionnaire included demographic questions regarding the type of dental office age, gender, and level of dental anxiety. Figure 1 shows the MDAS, which was used to assess dental anxiety.11 Participants were asked to respond to the questions based on their level of agreement. 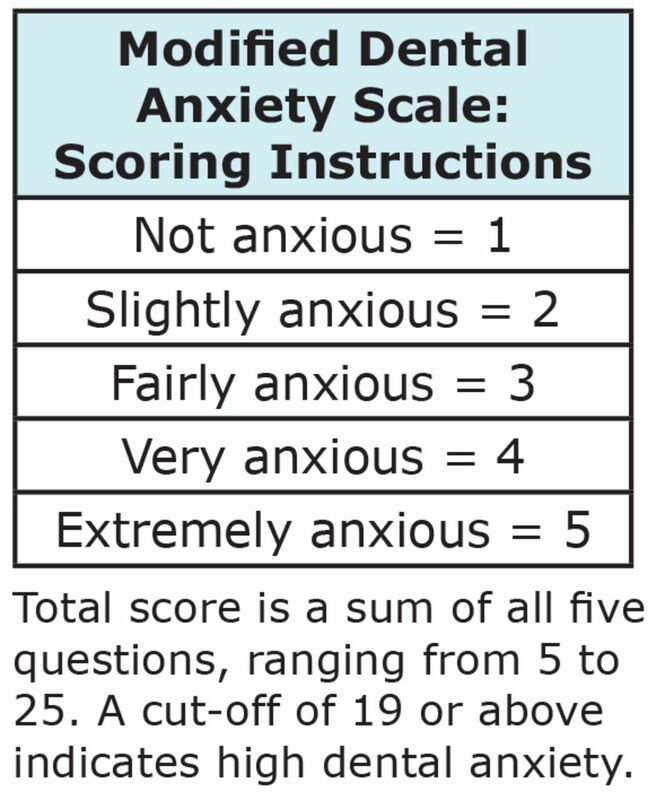 Possible responses include: not anxious, slightly anxious, fairly anxious, very anxious, and extremely anxious.11 Using a Likert scale, not anxious is equal to a score of 1, slightly anxious is equal to a score of 2 and so on.11 The sum of all five questions can range from 5 to 25, with 5 being not anxious and 25 being extremely anxious.11 Any score of 19 or higher indicates a highly anxious patient.11 Similar research using this survey determined any score of 11 or higher indicative of moderate to high dental anxiety.9 One open-ended question was included to ask if patients had ever missed a dental appointment due to their anxiety and, if so, what they believed was the source of their dental anxiety. Data collected from the survey was downloaded into Microsoft Excel and imported into STATA® statistical software version 11.2 for analysis. As per the survey responses, demographics including age, gender, and dental office type were enumerated using frequency percentiles and summary statistics. Differences in age and gender across dental office type were assessed via ANOVA and Fisher's Exact Test. Modified Dental Anxiety Scale (MDAS) scores were tabulated for each survey. MDAS scores were assessed as both a linear continuous outcome and a binary outcome (MDAS score ≥19). Using the binary outcome (MDAS score ≥19) as an indicator of dental anxiety, dental anxiety prevalence across dental office types was enumerated with exact Binomial 95% Confidence Intervals. The prevalence of moderate to high dental anxiety (MDAS score >15) was determined as a percentage of the entire study population. Univariate and multivariate linear and logistic regression models were used to assess associations between age and gender on MDAS scores (both continuous and binary). Qualitative analysis was used to analyze answers from the one open-ended question on missed appointments and dental anxiety. Themes were identified among all participants' answers and coded accordingly. There were a total of 308 participants; 200 from the general dental office, 99 from the endodontic office, and 9 from the periodontal office. Table I shows the demographic characteristics of the study population; 59% of participants were females; the mean age of the study population was approximately 52 years (SD 14.7 years) with an age range between 18 and 90 years. Mean MDAS score for the total study population was 10.19; with 10.06 from the general dental office, 10.59 from the endodontic office, and 9.22 from the periodontal office. Using the cut-off score of ≥19, the prevalence estimate of high dental anxiety within the total study population was 6.82% (Exact Binomial 95% CI: 4.27%-10.23%); 5% within the general dental office (Exact Binomial 95% CI: 2.42%-9.00%), 3.16% within the endodontic office (Exact Binomial 95% CI: 5.68%-19.01%), and 0% within the periodontal office (Exact Binomial 95% CI: 0.00%-33.63%). Using the cut-off score of >15, the percentage of participants with moderate to high dental anxiety was 19%. Table II shows univariate and multivariate logistic regression models using the MDAS score as a binary variable based on the cut-off score of ≥19. As per the MDAS score ≥19 cutoff, the odds of dental anxiety is 3.19 (95% CI 1.05, 9.71) times greater for females than males. The univariate association between binary MDAS score and age was not found to be statistically significant. A multivariate logistic regression model includ-ing both gender and age showed little change in the estimated odds ratios for gender and age respectively, with additional controlfor office type showing little change with identical inference (odds ratio for gender 3.28; 95% CI 1.06, 10.01). Table III shows univariate and multivariate linear regression models for the MDAS scores when used as a continuous variable. Females had a mean MDAS score 2.12 points higher than males (95% CI 1.09, 3.15), with mean MDAS score 0.08 points lower for each one-year increase in age (95% CI −0.12, −0.05). A multivariate linear regression model including both age and gender showed little change in the estimated regression coefficients. Additionally controlling for office type showed little difference in the estimated regression coefficients for age and gender on mean MDAS score, leading to identical inference. As per the qualitative analysis, 26 participants (8.4%) responded to missing a dental appointment due to dental anxiety; 17 from the general dental office, 8 from the endodontic office, and 1 from the periodontal office. Five common themes were coded as being the source of dental anxiety: fear of dental experience (8), previous negative dental experience (13), cost of treatment (2), gag reflex (1), and fear of bad news (2). The results of this study indicate there was no statistically significant difference in the prevalence of high dental anxiety among different types of dental offices. This suggests the type of dental procedure being performed may not be a significant factor in terms of dental anxiety. The prevalence estimate of 6.82% for high dental anxiety among the study population is lower than expected when compared to other studies, which indicate a prevalence of 10-20%.8-11 However, the percentage of the study population with moderate to high dental anxiety (19%), suggests that a substantial portion of the patient population suffers from some degree of anxiety and would benefit from anxiety-reducing measures during treatment. There are several limitations to this study. The overall response rate of 308 is low; the response rate of 9 for the periodontal office is too low to draw any significant conclusions for this type of office specifically and also makes it difficult to compare data between the three offices. The mean age of the patients was 52 years, suggesting that young adults and elderly populations may not have been adequately represented in this sample. Participants were not asked if it was their first visit to the office and those who were new patients may have been more likely to feel anxious compared to those who had been receiving care at a familiar office for a period of time. All three offices were located in one community, making it difficult to generalize results to other populations. Another limitation is the cross-sectional design of the study, which does not allow for causality to be shown. Also, studies such as this one, using self-reported data, are likely to introduce bias into the study results, as participants may not answer questions honestly or may misunderstand what a question is asking. Suggestions for future research include longitudinal studies to examine possible correlations between gender, age, socioeconomic status and dental anxiety. It is important to survey those who do not regularly seek care at dental offices, as research suggests that those with high dental anxiety may avoid regular care altogether.3-5 For this reason, it would be beneficial to reach out to a larger segment of the population; not limited to those who are actually arriving for treatment at a dental office. Further research should also be conducted to examine possible correlations between dental anxiety and missed appointments, as well as whether the use of dental anxiety assessments in dental offices improves patient outcomes. A qualitative research design could provide a deeper understanding of sources of dental anxiety as well as anxiety-reducing measures that patients feel would lover their dental anxiety. Although it may be helpful to assess the prevalence of dental anxiety among a more representative sample of the population as in previous studies,8-11 dental offices may directly benefit from assessing the prevalence of anxiety among their patient population. Dental hygienists are in a unique position to assess patient comfort and to educate patients on dental anxiety and coping mechanisms. Anxiety assessments such as the MDAS are arguably an easy, reliable way to assess dental anxiety so that care can be more patient-centered and effective. Being aware of patients' anxiety may contribute to the dental professionals' establishment of a trusting rapport and thus encourage routine care in an effort to help patients maintain optimal oral health. Angela M. White, RDH, MS, is a graduate of the Master of Science program at the Forsyth School of Dental Hygiene, MCPHS University, Boston, Massachusetts. Lori Giblin, RDH, MS, is an Assistant Professor and Linda J. Boyd, RDH, RD, EdD, is a Professor and Dean at the Forsyth School of Dental Hygiene, MCPHS University, Boston, Massachusetts. This manuscript supports the NDRHA priority area, Client level: Oral health care (new therapies and prevention modalities).
. Fear, stress, and the well dental office. Northwest Dent. 2006;Mar-Apr; 85(2):10-1,13,15-8.
. Gagging and its associations with dental care-related fear, fear of pain and beliefs about treatment. J Am Dent Assoc. 2014 May;145(5):452-457.
. Relationship between dental anxiety and pain perception during scaling. J Oral Sci. 2011 Sep;53(3):341-348.
. Prevalence of dental fear and phobia relative to other fear and phobia subtypes. Eur J Oral Sci. 2009 Apr; 117(2):135-143.
. Behavior-associated self-report items in patient charts as predictors of dental appointment avoidance. J Dent Educ. 2009 Feb;73(2):218-224.
. What goes around comes around: revisiting the hypothesized vicious cycle of dental fear and avoidance. Community Dent Oral Epidemiol. 2013 Jun;41(3):279-287.
. Regular dental visits and dental anxiety in an adult dentate population. J Am Dent Assoc. 2005 Jan; 136(1):58-66.
. UK population norms for the Modified Dental Anxiety Scale with percentile calculator: adult dental health survey 2009 results. BMC Oral Health. 2013 Jun24;13:29. doi:10.1186/1472-6831-13-29.
. Prevalence and socio-demographic correlates of dental anxiety among a group of adult patients attending a dental institution in Vadodara city, Gujarat, India. Indian J Dent Res. 2011 Jan-Feb; 22(1):179-180.
. A national cross-sectional survey of dental anxiety in the French adult population. BMC Oral Health. 2007 Oct;7:12.
. The modified dental anxiety scale: UK general public population norms in 2008 with further psychometrics and effects of age. BMC Oral Health. 2009 Aug 26;9:20. doi:10.1186/1472-6831-9-20.
. Factors associated with dental anxiety and attendance in middle-aged and elderly women. Community Dent Oral Epidemiol. 2000 Dec;28(6):451-460.
. The prevalence of dental anxiety across previous distressing experiences. J Anxiety Disord. 2011 Mar; 25(2):232-236.
. The use of dental anxiety questionnaires: a survey of a group of UK dental practitioners. Br Dent J. 2001 Apr 28;190(8):450-453.
. Psychometric properties of Greek versions of the Modified Corah Dental Anxiety Scale (MDAS) and the Dental Fear Survey (DFS). BMC Oral Health. 2008 Sep 30; 8:29-6831-8-29.
. Additional psychometric data for the Spanish Modified Dental Anxiety Scale, and psychometric data for a Spanish version of the Revised Dental Beliefs Survey. BMC Oral Health. 2010 May 13;10:12. doi:10. 1186/1472-6831-10-12.
. Reliability and validity of the Modified Dental Anxiety Scale (MDAS) in a Turkish population. Community Dent Oral Epidemiol. 2005 Oct;33 (5):357-362.
. Does completing a dental anxiety questionnaire increase anxiety? A randomised controlled trial with adults in general dental practice. Br Dent J. 2006; 201(1):33-35.
. Do dental anxiety question-naires raise anxiety in dentally anxious adult patients? A two-wave panel study. Prim Dent Care. 2007 Jan;14 (1):7-11.